New Trends Shaping the International Order – Perspectives from the U.N.
How essential is the Transatlantic relationship in face of increasing economic, political and military power of China and Russia? What should be the international response to global challenges such as climate change, migration and terrorism? Please join us for a discussion with Permanent Representative of Finland to the U.N., Ambassador Kai Sauer, who will share his views about UN’s role in the current international climate where the rules-based international order is under pressure and the status quo is replaced by re-distribution of power. 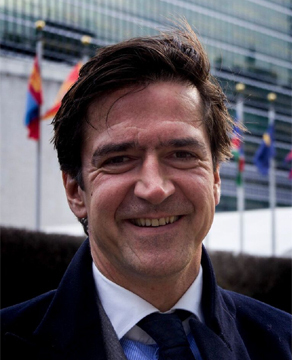 Ambassador Kai Sauer is the Permanent Representative of Finland to the United Nations. He has held the position since 2014. Ambassador Sauer has worked for the Finnish Foreign Ministry for nearly 25 years and served in Croatia, Kosovo, Austria and the US. Before moving to New York, Mr. Sauer served 4 years as the Ambassador of Finland to Indonesia, Timor-Leste and the Association of Southeast Asian Nations. He has also held several senior UN positions. Ambassador Sauer was born in Hamburg, Germany in 1967. He graduated from Tampere University in 1995 with a Master’s in International Relations. He has also studied in Hamburg and Berlin. In 2007, the Finnish President awarded Ambassador Sauer the honorary title of First Class Knight of the Order of the Lion of Finland. In 2014, University of Tampere awarded him as the Alumni of the Year. Ambassador Sauer’s military rank is corporal.